Floppy disks have disappeared from the market since many years now, but surprisly the machines needed them still largely being used in various domains : Video games, Retro computing, Music, CNC machines (manufacturing/industrial process)... Early 2000s an alternative to the floppy disks was needed for these machines because the floppy support in PC machines started to disappear and the floppy disks reliability and quality was getting worse and worse. I personnally started this project in 2006 to revive my Atari ST & Amiga machines and make them easier to use in the incoming world without floppy disks and floppy drives. The project have grown with the various support requests received during all these years. It now supports hundreds of machines and floppy formats. See the showroom to have a preview of the currently supported machines. The HxC Floppy Emulator project main idea is to completely replace the floppy disk drive by an electronic device. 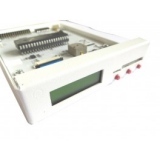 This electronic device emulate the floppy disk drive behavior and functionnalities. The HxC Floppy emulators are designed to be very versatile and to support a large variety of computers / keyboards / samplers / CNC machines at a reasonable price. The HxC Floppy Emulators support most existing floppy formats. 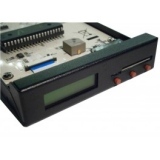 Today the HxC Floppy Emulator is a well established floppy disk drive replacement solution present into the retro-computing domain, Music domain and industrial domain. 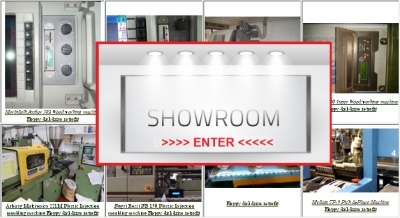 See the showroom to have a preview of supported machines. - A SDCARD version which allows to emulate floppy disks which images are stored in a SDCARD. For more information on this interface, go to the "SD HxC Floppy Drive Emulator" part. - A USB version which allows to connect the floppy disk drive interface of the computer to a PC via a USB cable. For more information on this interface, go to the "USB HxC Floppy Drive Emulator" part. In the table below, you can find a preview list of supported machines and floppy file images. For a more complete list, please visit the HxC Floppy Emulators compatibility table. Note : Some computers/hardwares are probably missing in these lists. 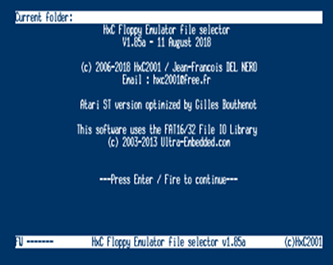 If you have tested the HxC Floppy Emulator successfully with another hardware or if you want a new file/hardware support, don't hesitate to contact us. *.ST 9,10,11 and 18 (1.44MB) sectors/track format supported. *.STT Steem Imager file format. "Non images" files. The HxC Floppy Emulator software allows to create an virtual FAT12 (Atari ST/ MS DOS) floppy disk containing files present in a PC folder. UAE / Extended ADF New and old version supported. *.ADZ Based on the zlib. *.IPF 26/03/2008 > New software and CPLD core -> Full support of protected floppies image. Variable bitrate and flakeys bits protection are now supported. "Non images" files. The HxC Floppy Emulator software allows to create an virtual AmigaDOS floppy disk containing files present in a PC folder. *.DSK Caution : Some MSX2 computers use a non-standard floppy connector pinout. Please check that the computer pinout is compatible with the HxC Floppy Emulator or use an adaptator. MFM-256bytes/sector or FM-128bytes/sector, 16 sectors/tracks, 2 or 1 sides. TI99 PC99 MFM & FM tracks supported. JV3 write support done by David Barr. Thanks to him too ! :) And another video here ! *.LDF Tests on the real hardware done . *.HDM 360RPM, 500Kb/s, 8 1024Bytes sectors, 2 sides, 77 tracks floppy format. *.SMC Create a MS-DOS FAT12 floppy disk containing the SMC Super NES / Super Famicon ROM file. *.EM1 & *.EM2 Note : The operating system image (emaxos.emx) must be present in the same folder than the bank files. *.EII Note : The operating system image (emuiios.emuiifd) must be present in the same folder than the bank files. Credits & Thanks: E-mu Emulator I & II support was possible thanks to Jan Kiefer who supply all necessary materials and supports, to the Software Preservation Society team for the reverse engineering of the EmuII Floppy disk format, and to Kris Van de Cappelle (EMXP developer) for the tests and EmuII technicals informations. Thanks to rosefloyd for the tests on the SP1200 hardware! MS DOS Floppy disk image Note: The virtual floppy disk image can be generated from midi files with the software. MS DOS Floppy disk image Note: The virtual floppy disk image can be generated from midi files with the software. Video demo. MS DOS Floppy disk image Note: The virtual floppy disk image can be generated from files with the software. Raw sector images/Floppy dump. More details on the forum. TD0 Teledisk format *.TD0 Teledisk file format: Normal and advanced compression supported. Note: supported modes: MFM & FM. MFM file format *.MFM Internal format of the software: contains encoded tracks. AFI file format *.AFI Advanced floppy image: Contains Track data, variable bitrate, flakey bits informations. HxC Floppy Emulators supported machines / compatibility table. To download the software please go to the software section. - Shugart compatible mode supported. - PC compatible mode supported. - 5V +/- 10% standard power floppy connector input. - 500mA max. (80mA in standby). - 3 LEDs ("Power LED","Floppy access LED"," SDCard access LED "). - 2*16 chars Alphanumerical LCD. - SD Card up to 2GB. - SDHC Card supported up to 32GB. - FAT12/FAT16 & FAT32 supported. Subdirectory and long name file supported. -> More than 8000 HD (1.44MB) Floppy Images on a 32GB SDCard ! -> More than 16000 DD (720KB) Floppy Images on a 32GB SDCard ! - Write support : ISO MFM/DD 128/256/512/1024/2048/4096/8192Bytes sector write supported. - Write support : ISO FM /SD 128/256/512/1024/2048/4096Bytes sector write supported. - E-mu (Emulator I / II / SP1200) Write support. The host machine can format the image with the right disk setup exactly as with a real floppy disk ! No need to already have an image with the right format, just make it by formatting it ! - 300 RPM, 360 RPM supported. - (others special RPM available/supported). - Up to 255 tracks per floppy. - 1 or 2 sides. - Firmware update via the SD Card. - Last Loaded Floppy Image autostart at power up. - Fast floppy image loading (<<1second), no conversion time. - Floppy Emulator ready at power up! Boot sequence possible right after the power up ! - SD Card Direct Access mode : Direct Floppy to SD bridging. - Host control : The host machine can send commands to the emulator to change the current selected image. - File image renaming embedded function. - Supersized DOS Floppy emulation! : Up to 5 MB free per floppy image file ! The original CRC/checksum fields are present into the HFE images ! No direct usage of not secured IMG/IMA/”ISO” images or direct flash media bridging without CRC in floppy emulation mode ! The SD HxC Floppy Emulator can be bought on the Lotharek online shop and ebay page. Please go to the download section to get the latest version. With the HxC File selector the host computer can access directly to the SDCard to select files images and change the SDCard HxC Floppy Emulator settings. The LCD screen and the buttons are becoming optional / useless. You can even remove the LCD screen to put the SD HxC Floppy Emulator inside the Amiga/Atari/CPC computer without case modification. Atari ST, Amstrad CPC and Amiga versions of this tool are currently available. Note : Please go to the download section to get the latest version. - USB 1.1 device interface (based on the FTDI FT245.). - MFM, FM and GCR compatible (can handle custom encoding). - Bitrate between 63Kbits/s and 1MBits/s. (250 differents bitrates by step of 62.5ns). - Variable bitrate, flakey bits and long tracks, custom tracks support (emulation of copy protected floppies). - Can emulate floppies up to 128 tracks. - "jumper free" design : Device configuration done by software. - Flexible floppy interface: Shugart, IBM PC and Amiga compatible. 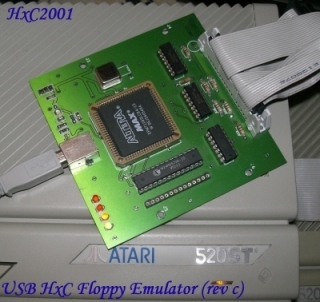 All necessary informations to build your own USB HxC Floppy Emulator are available here. The main part of the USB HxC Floppy Emulator is a MAX EPM7128S CPLD from Altera with 128 Macrocell. This chip is connected to a 32KB SRAM memory buffer and a FT245 from FTDI for the USB communication. Warning : Do not disconnect the floppy ribbon while the USB is connected. This may damaged the emulator and your equipements. Always disconnect the USB cable before connecting/disconnecting the Floppy ribbon. The bitstream to use to program the CPLD is available here. To program this chip you can use Quartus II and an Altera compatible JTAG probe (The ByteBlaster for example). The programmer software can be downloaded from the Altera website. 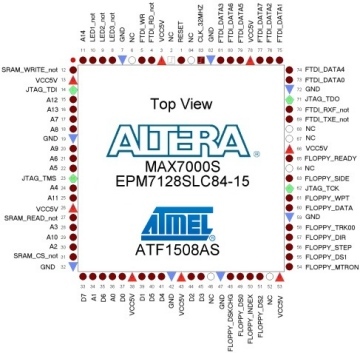 Note : The EPM7128S CPLD can also be remplaced with the Atmel ATF1508AS. D2 : Select LED : Is on when the target computer acccess the floppy disk. D3 : Step LED : Is on when the target computer is stepping/changing track. D4 : Link LED : This is the USB link status: Is on when dialoging the host PC. How to build the USB HxC Floppy Emulator ? - An "homebrew" version (Rev B). This is a one layer "Do It Yourself" PCB. - A "Production" version (Rev C). This is a two layers PCB. I recommend this version since it have a better layout. Regarding the features of the board there are no differences between these two boards. 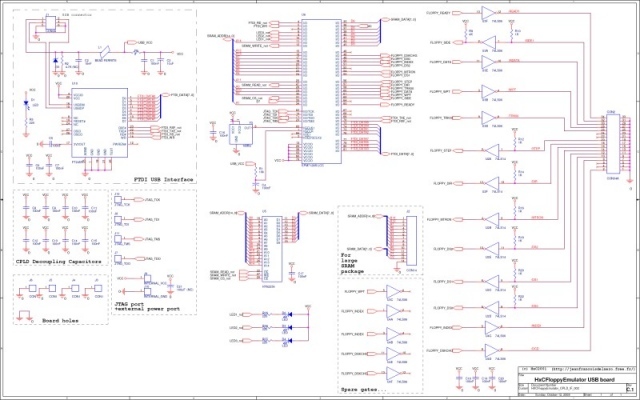 You can downlead the Schematic / PCB Layout / BOM of the revision B & C board here ! If you don't want build it, this board is also available to purchase. Have a look to the sale points section. This program also allows you to convert floppy file images for the SDCard based HxC Floppy Emulator. -> Windows 2000 / XP / Vista / Seven / 10. 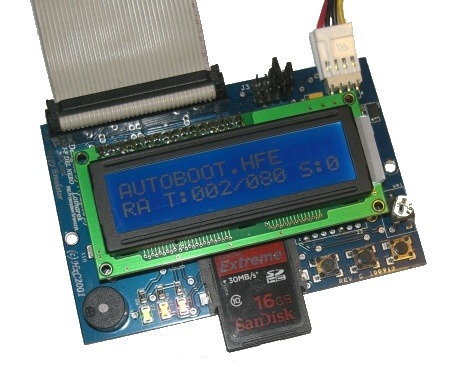 - The USB HxC Floppy Emulator support is based on the FTDI D2XX Direct Drivers. If you have the USB HxC Floppy Emulator you must install this driver. Note : Please go to the download section to get the latest software version. > HxC Floppy Emulator DOS Disk Browser : A new DOS image type browser solution Please have a look to the README file for more details ! > VFD - Virtual Floppy Drive for Windows with DOS/FAT HFE files images support ! > ADF Opus - An Amiga floppy image browser with HFE files images support ! > SD HxC Floppy Emulator mounting kit documentation. The following elements allow you to program the low cost Gotek USB Floppy Emulator with the HxC bootloader & Firmwares. > Online customization firmware ! Modify it as you want and receive the firmware in your email box some minutes later ! 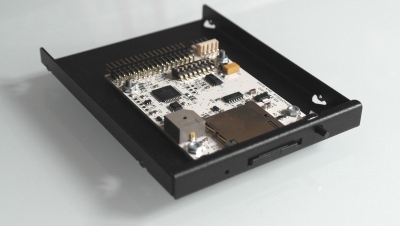 The USB HxC Floppy emulator and SD HxC Floppy Emulator are produced and sold by Lotharek. WinImage (shareware) : a Windows program to create/modify dos/fat12 files images. ImageDisk : A DOS software to read/write floppy disk. OmniFlop : a Windows program to read almost any kind of non standard floppy disk. VFD - Virtual Floppy Drive : a Windows Floppy disk drive emulator : This software is able to mount an .IMG file as a floppy disk drive under windows. All pictures / videos of the project can be found on this page! Jean-François DEL NERO (Jeff) Project Initiator - Main project developper/maintainer. Gregory ESTRADE (Torlus) Forum hosting, FAT32 support of the SD HxC Floppy Emulator. Christophe ESC. (Giants) Manufacturing of the First USB HxC Floppy Emulator batch. Przemyslaw Krawczyk (Lotharek) Manufacturing and selling facilities. Arnaud STORQ (Norecess) Amstrad CPC file selector optimization and support. Gustavo E. A. P. A. Batista TRS-80 JV3 support implementation. David Barr TRS-80 JV3 write support implementation. 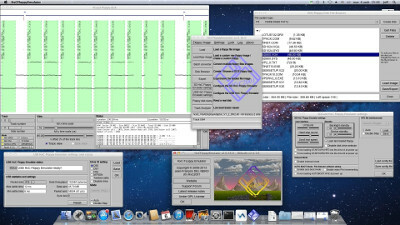 Kris VC (Esynthesist) Providing a great help for the E-mu Emulator I & II support. (Technical informations and tests). The Software Preservation Society Team Providing the first E-mu Emulator I & II floppy disk dump and E-mu track format. Joseph REDON (Namida) NEC PC88 support tests. Alex Mena x68000 support tests. Petari Atari ST ST/MSA/STT support tests. Jan Kiefer E-mu Emulator II tests. Rosefloyd (One MPC Two DJ'S) E-mu SP1200 tests and some demos videos. And thanks to all others who contribute to the project by reporting bugs, submitting new ideas, contributing code, spreading the word about the project !